Skylanders Giants Single Character Packs Only $3.99 + FREE Prime Shipping (Reg. $10)! You are here: Home / Great Deals / Amazon Deals / Skylanders Giants Single Character Packs Only $3.99 + FREE Prime Shipping (Reg. $10)! Your Skylanders fan(s) is sure to love seeing these under the tree this Christmas! 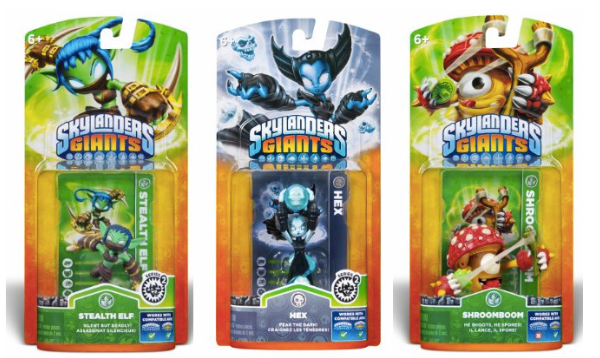 Right now you can snag these Skylanders Giants Single Character Packs for only $3.99 (Reg. $10)! Just hover your mouse over the different characters to see the prices. Plus, FREE Shipping is available with Amazon Prime or FREE with orders of $35 or more (sign up for a FREE 1 month trial here)!